A hot tub is a large investment – much like purchasing a car – and you want your investment to last as long as possible. You want the people who use it to be safe, which is why you need hot tub chemicals. Keeping your hot tub clean and sanitized is not only important for your tub, but it’s also important for the people in it. Let’s take a look at some of the chemicals that you NEED for your hot tub. You have to decide on which type of sanitizer you will use. Chlorine is an excellent sanitizer for your hot tub. However, chlorine mixed with hot, steamy water can create an unpleasant chlorine smell, which is why some hot tub owners stay away from this chemical. There is a reason behind the chlorine smell. When chlorine goes into your water and attacks bacteria or algae, it dies – just like certain bees when they sting you. That dead chlorine is then gassed off which is called oxidation. That means, when you smell chlorine, it’s not in the water – it’s in the air. Bromine is a popular choice for hot tubs and indoor pools because it doesn’t have that chlorine bleach smell. That’s because bromine works differently than chlorine, even though they are in the same halogen family. BaquaSpa is a biguanide sanitizer: a non-chlorinating product that kills bacteria much like chlorine and bromine do. This may seem awesome, but there are some draw backs to using this type of sanitizer. First, it cost more than bromine and chlorine, and it may be hard to find. Not all pool and spa dealers carry these products. You’ll want to check with your hot tub manufacturer before using it because biguanides are known deteriorate some parts in your hot tub, including rubber gaskets and certain plastics. This is my favorite of all the sanitizers. Mineral systems like Nature 2 use copper, silver, and other minerals to kill bacteria in the water. However, it’s not as aggressive as chlorine and even a little slow. That’s where chlorine comes in. Along with using a mineral purifier in your tub, you will need to add a little bit of chlorine as a backup in case the minerals don’t kill all the bacteria fast enough. It also helps to give the water a fresh smell. Without chlorine, the water would smell stale. Proper Level For Sanitation: 0.5 ppm (parts per million) of chlorine – that’s half a part! 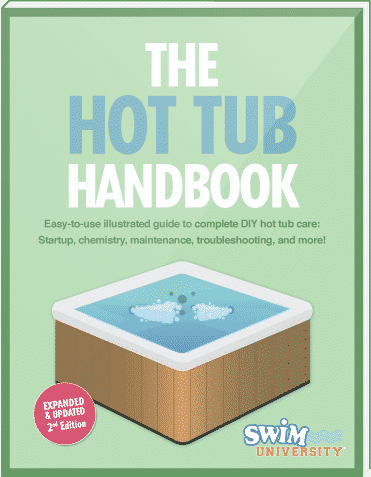 All hot tubs should be shocked once in a while based on how many people use the tub and how frequently. Some shocks even have additional benefits (depending on the brand), including pH buffers and water clarifiers. Make sure you purchase the right shock for the type of sanitizer you use. The shock oxidizes (gasses off) the dead chlorine along with body oils, sweat, dirt, and urine. It reignites the non-working bromides and gets them killing again along with getting rid of oils, sweat, dirt, and whatever else comes off our bodies. For mineral systems, I recommend using a non-chlorine shock to keep the chlorine levels low. BaquaSpa or biguanide chemical systems have their own version of shock designed specifically for the brand you use. To keep your sanitizer at the right level and working efficiently, you need to keep your water’s pH balanced. pH is a measure of the acid or base of a solution. If your water has low pH then your water will be acidic, like vinegar. If you water has high pH it will be dry, like baby powder. Alkalinity is a pH stabilizer which helps keeps your pH from changing drastically. First, adjust your alkalinity to the correct level, and then fine tune your pH levels if needed. If both your pH and alkalinity levels are low, just adding alkalinity will increase both, but make sure to adjust the pH if the alkalinity doesn’t bring it up to the correct level. If both your pH and alkalinity levels are high, use pH decreaser to drop it back to the right level. These two chemicals are very inexpensive but extremely important – especially in a hot tub. Because a hot tub has such a small body of water, the pH and alkalinity have a tendency to fluctuate a lot. It’s important to keep a close eye on these levels by testing it frequently. Calcium Hardness hardens the water, which prevents the water from slowly eating away and breaking down your hot tub’s shell, pipes and other parts. This chemical is important for the life of your hot tub and not really for the health of it’s occupants. This chemical is very inexpensive and needs to be added at the beginning of every fresh refill. Hot Tub Chemistry 101 is Complete. Congratulations! In conclusion, these are all the chemicals you NEED to care for your hot tub properly. Of course there are other chemicals you can use including, clarifiers and cleaners, that you may need in case of any water issues. Speaking of water issues, the great thing about a hot tub is if you are having problems with water clarity, algae, or scaling, you can drain and refill the hot tub with ease – unlike a giant swimming pool. In fact, you should drain your hot tub every 3 or 4 months and refill it with fresh water.